Cempaspuchitl is the name given to Mexican marigold flowers (Tagetes erecta). The word "cempasuchitl" comes from the Nahuatl (the language of the Aztecs) word zempoalxochitl which means twenty-flower: zempoal, meaning "twenty" and xochitl, "flower." The number twenty in this case is used to mean numerous, most likely referring to the flower's many petals, so the real meaning of the name is "flower of many petals." These flowers are also often referred to in Mexico as flor de muerto, which means flower of the dead, because they figure prominently in Mexican Day of the Dead celebrations. Marigolds are bright orange or yellow in color, and they have a very distinct scent. 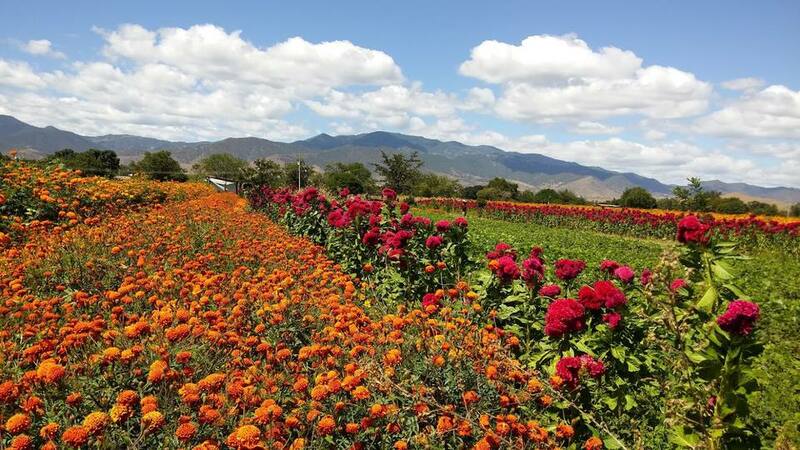 They bloom at the end of rainy season in Mexico, just in time for the holiday during which they play such a vital part. The plant is native to Mexico and grows wild in the center of the country, but it has also been cultivated since ancient times. The Aztecs grew cempasuchitl and other flowers in the chinampas or "floating gardens" of Xochimilco. Their vibrant color is said to represent the sun, which in Aztec mythology guides the spirits on their way to the underworld. By using them in Day of the Dead rituals, the strong aroma of the flowers attracts the spirits who,are believed to return to visit their families at this time, helping them to find their way. In a similar way, burning copal incense is also thought to help guide the spirits. Flowers are a symbol of the impermanence and fragility of life and have many uses in Day of the Dead celebrations. They are used to adorn graves and offerings along with candles, special foods for Day of the Dead such as bread called pan de muerto, sugar skulls and other items. Sometimes the petals of the flowers are pulled out and used to make elaborate designs, or placed on the floor in front of the altar to mark a path for the spirits to follow. Marigolds are the most popular flowers used during Day of the Dead celebrations, but there are other flowers that are also commonly used, including cockscomb (celosia cristata) and baby's breath (Gypsophila muralis). Besides their ritual use during Día de Muertos celebrations, cempasuchitl blooms are edible. They are used as a dye and food coloring, and also have some medicinal uses. Taken as a tea, they are believed to alleviate digestive ailments such as stomach ache and parasites, and also some respiratory ailments. Learn more Vocabulary Words for Day of the Dead. This Christmas flower originated in Mexico. Learn about its history.